Many Viano drivers are having their spare wheel stolen from under their vans and, literally in some cases, their noses. Having had the misfortune to have had to change a flat tyre, on the hard shoulder of the M20 at 0430am while POB, it was a relief to note that Mercs had put some thought into such a situation. I dropped the wheel and released it in under 3 minutes without having to crawl under the vehicle in my best M&S suit. All good, but this simple system also works in the favour of the thief. They, apparently, push a cushion under the spare, snip the cable and effortlessly steal your wheel. There is speculatation that London cabbies are inadvertently supplying a market for the thieves in their new style Vito's but there is certainly no shortage of takers as there seems to be more Viano drivers who've suffered than not. It is a big season for sport in the UK at the moment with most eyes fixed towards Brazil and the World Cup. No one in Blighty ever really expected any more than we got from England (again) we just hoped against hope. And so, the only football song worth singing, 3 Lions on the Shirt, extolling our '30 years of hurt' is now actually 48 years of hurt............and counting. Sports criss-cross at this time of year with ardent football fans happy to 'get into' the cricket at Lords or tennis at Wimbledon, just so long as the Brit Andy Murray is doing well. They'll lose interest and start to Google the new seasons fixture list as soon as Andy the Scot is knocked out. For horse racing we flock in our thousands to the Epsom Derby and soon after to Royal Ascot, a tradition of pomp and circumstance since Queen Anne kicked it all off in 1711 (though why she didn't just settle on a 5pm start is beyond me). The great and the good flow into affluent Berkshire to witness the flat seasons best nags, the gents bedecked in top hat and tails and the ladies beautifully resplendent, finally realising the culmination of many hours shopping and deliberation to at last parade like horny peacocks up and down the paddocks. More often than not, where they flowed in they are later poured back, into chauffeur cars and coaches for the long journey home. The toffs in familiar Bentleys while the wannabe's choosing a classic pink stretched limo which best befits their breeding. Thought to have been happening for hundreds of years, the origin of pushing a huge round of cheese down a 1 in 3 hill while being pursued by a gaggle of lunatics ( no one can cite defamation as I have stood on Coopers Hill and you need to be crazy to jump down it) are vague, and if honest slightly boring. Instead, let's just marvel at the fact that this event is still being run today if for no other reason than it is an illegal event, in the eyes of the police and local council who refuse to sanction the day anyhow. So be warned that aside from a few St Johns ambulance volunteers, there is very little assistance to be found should your foot happen to end up facing the wrong way when you land (also witnessed at Coopers Hill). Alas, it will also means your travel insurance is null and void too. The rewards for the 1st person over the finish line, as you are not expected to keep pace with a cheese travelling at 70 mph, are well short of worthy for such do-daring but the £10 prize fund does deter the hustlers and professionals from bothering.........that and the risk of serious injury. Cheese rolling takes place on Coopers Hill, Brockworth, nr Gloucester, (07785368693) on the Spring Bank Holiday Monday. To enter you need to turn up early as the police block the road, climb the hill and join the toothless morons drinking Scrumpy and then take a deep, deep breath. The first person ever to pick up a hand full of Nettle, an aggressive little weed with the ability to first sting then irritate the skin, pop it into their mouth and eat it was probably drunk, being dared or both. But then to establish a World Championship for Nettle eating!? Well, only the British. The Bottle Inn, nr Bridport hosts this enigma with locals to internationals (ok, curious tourists) all sitting to devour as many stalks as they can hold down with-in the allotted time. Liquid refreshment is allowed, if not imperative, but no other assistance bar the encouragement of the gathering is permitted. Set in the middle of the pubs June Beer Festival the chance to become a World Champion is too good an opportunity to turn down for the dozen or so tingly mouthed entrants. Visit www.bottle-inn.co.uk for details. The activity of bog snorkelling was started in 1976 near Llanwrtyd Wells, Wales, which apart from being officially the smallest town in the United Kingdom is a rather ordinary and, dare I say it, drab place. So to attract more tourists a plan was hatched from an over-the-bar conversation at The Neuadd Arms. The World Bog Snorkelling Championship, first held in 1985, takes place annually every August Bank Holiday at the dense Waen Rhydd peat bog, near the aforementioned boring town. In 2013 Dineka Maguire broke the previous World Record set by Andrew Holmes. Dineka's time was 1:23.13 secs, also making her the Ladies champion. Google, www.green-events.co.uk and get a tetanus jab. Well today is St George's Day. A day celebrated in England not even a little bit as enthusiastically as St Patricks Day. Why is this? Don't get me wrong, I've nothing against Ireland but I find it a little amusing that we celebrate the national day of Ireland over the national day of England. Then it hit me... This is what's so fantastic about England. We're so self deprecating that we don't want to celebrate George for fear of being branded a nationalist, we're such a vibrant multi-cultural society that we'd rather drink Guinness with someone whose great aunt was born in Ireland than toot our own horn. I'm sure there's many more I haven't mentioned so feel free to comment. But tonight, just tonight, don't have that Belgian Lager or that take away. Go to your local pub, raise a pint of London Pride above your pie, mash and liquor, then toast England. And tomorrow we can be British and Europeans again. Alright so it's not in London, in fact it's a long way away in Aintree, near Liverpool but this weekend is the long awaited Grand National. The FA Cup Final of horse racing. I'd imagine true racing fans find it a bit annoying that there's this day where everyone jumps on the wagon and betting shops are filled with once a year experts but for one day only, the sport comes to the attention of every living room in the country. It's the one day a year when everyone allows themselves a bet. From your nan having a sneaky £1 on a horse and inexplicably winning to 20-somethings in pubs who've read the Racing Post over a fry up, laying £50 over 12 different each way "long shots". And the tragedy is, calling this race is damned near impossible. Forty riders over 4 miles and a prize of over half a million pounds to the winner makes this race one of the most competitive in the world. Reputations are won and lost over Aintree's fences and some poor horses race their last race in this classic. Of course, with all the interest around the day, parking is in short supply. And let's be honest, who wants to have the car for a day at the races? Hopefully you'll end the day with some champagne! The only way to enjoy the National in true luxury is to be chauffeur driven, to the door, and have your car waiting for you when all the races have been run. Chirton Grange, through partners in the area can supply a car for the day at some of the most competitive rates going. Click here to make a booking. Yes, the Crossrail is being built across London. This is an underground tunnel that will combine East and West London without having to stop at various tube stations and make changes along the way. Now, some people would claim this massively convenient way of getting across town will be bad for business, but actually we don't think it will be. You see, most of our work is contracted and involves driving various important foreign guests around London. Their hosts would never put them on a train and, more importantly, they are rarely crossing London, mostly they are going from Heathrow into town. Actually, what we're anticipating is actually it should ease (if only slightly) congestion on London's roads. Anyway, back to the title, one of the more peculiar stories to come out of the construction of these tunnels is the various things that get dug up along the way, in this case it's victims of the Black Death. For those who don't know, the bubonic plague spread across Europe in the 1350s and wiped out millions as it spread. Nowadays, outbreaks can be treated with antibiotics that weren't available at the time. During the "great pestilence" there were two mass graves set up outside the City walls at East Smithfield and Farringdon, some a further out in Blackheath (hence the name) and stretch as far as Gravesend (hence the name). 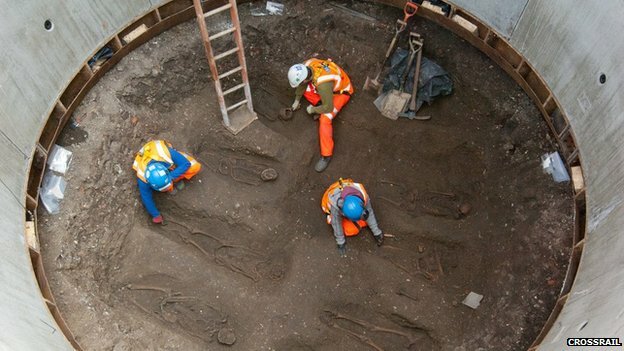 In March 2013, Crossrail workers uncovered 25 skeletons along with 14th Century pottery. Tests on 12 of these Skeletons have been returned now and apparently they can tell all sorts from skeletons that are 500 years old. The first thing is that most of them were malnourished and had rickets. Some had bad spinal injuries consistent with heavy labour and the strangest conclusion was that some were from as far north as Scotland, indicating London was as attractive to others as far back as 1450. The digging is only about half way through so who knows what else they'll unearth along the way, probably some of the victims of the Krays as they enter East London. What we do know is, London has a rich and vibrant history and we're learning more about it every day. Woodstock: Edge of Oxford or Beginning of the Cotswolds? Lying just 8 miles north of Oxford and a mere 20 (albeit slow) miles from Stow on the Wold, I am declaring the town of Woodstock as the epicentre of England. The busy A44 is the only drawback to the tranquillity of the town but the road makes up for its intrusion by allowing you only a 10-20 minutes car journey from Oxford. You wouldn't want to stay for more than 3 nights in Woodstock as it is more of a base to visit either Blenheim Palace, which is so close you can walk in, or Bicester village (20 minutes away by car). The experience of Woodstock is to get that City grime or airport jet lag off you. It has the quiet, laid back ambiance you are looking for, enough eating places and good hotels to recharge your batteries before heading into the Cotswolds. Woodstock has plenty of places to stay. My client was guest of the www.hopehousewoodstock.co.uk and spoke very highly of her stay in the Blenheim Suite. Hope House only has 3 bedrooms and 1 apartment. The Hope House owner warmly welcomed my client into his establishment which is beautifully decorated with four poster beds, adorned with Italian sheets and silk duvet covers. No sign of prices in the foyer (which was as far as this below stairs worker got) or on the website so with the old adage of 'if you have to ask then you can't afford it', I pushed off to my more humble abode for the night. Five minutes' drive later and I arrive at www.sturdyscastleoxford.com and it was a damn site easier to find than Hope House was (which doesn't want people to know it is a hotel, apparently). My sleeping needs when working, are simple and always carefully orchestrated by my wife/PA. I must be close to clients hotel, have parking, it must be clean and, financially, within our overnight allowance. Nicola very rarely lets me down but tonight she has surpassed her own high standards. Although I had to do one 'kerb crawlers' lap of the car park before finding a space, there is ample parking, and, to be fair, I arrive at 8pm on a Saturday night so I'm out of step with 'ordinary people' and their sensible jobs. The restaurant and bar are heaving and I stand at the small reception fully expecting to be way down on the priority list. Then one of the barmaids appears and spots me, sets a pint of Guinness in flow while asking, 'checking in?' Then, with a 'sign here and here' I am scuttling behind her towards my room, (yes, she even took me to my room) and still saw her back in time to scribe the clover onto the Black stuff. Ok, I exaggerate but she was as impressive as the room, which may have lacked Italian bed linen admittedly but was a large, fresh and clean bedroom and en suite. With the flat screen TV and free Wifi, I have all I need. I didn't eat in the restaurant that night but plenty of others did which suggests the food is good. Breakfast was large and served well and all that at £63.00 I will definitely be back...........and I can bring the dog if I pay the tenner. Blenheim Palace is the main attraction in this area. Set back from Woodstock, the Duke of Marlborough's 'des res' sits within its manicured grounds overlooking the lake, perfect for history buffs to discover the bygone ages and family secrets up and down the marble staircases. Winston Churchill was born and raised right here in Tory opulence (he is buried not one mile away in at St Martin's Church, Bladon) and if you pay for the day, you can upgrade free to a yearly pass. The weather today is gloriously sunny and 18 degrees, unheard of but welcome in March, so hundreds have dug out the pass to enjoy, if not the house again, then the gardens, lake and country walk up to the imposing statue of the 1st Duke of Marlborough, John Churchill. Dogs panting and kids on scooters make for a busy thrum around the grounds. The new restaurant annexe quenches thirst and hunger by serving up meals, hot soup and fantastic cakes for it's now weary visitors (after you have passed through the ubiquitous souvenir shop of course).